Would you use this classical feng shui love cure in your home? Does that mean that you should use the Mandarin ducks as a feng shui cure if you are looking to attract a love partner? It depends on you. The best answer is this: "Choose the Mandarin ducks as a feng shui cure to attract love only if you genuinely, completely and absolutely feel the energy of love and devotion when you look at them." Do the Mandarin ducks speak to you of love? Or a happy marriage? Be honest with yourself when you choose feng shui cures for your home, because you are the one to benefit (or not) from your honesty and intelligent feng shui work. Because feng shui is considered to have originated in China, most of the classical feng shui cures -- including the use of Mandarin ducks -- have their roots in Chinese folklore. If you grew up in China or Japan, where the Mandarin ducks are widespread -- you most probably have heard stories about the love and devotion of Mandarin ducks. They mate for life and are considered loyal and devoted to their chosen partner. Because in symbolic feng shui level one works with images and symbols to represent the desired energy, the Mandarin ducks have become the perfect feng shui cure for love. That is, in Chinese culture. Does that mean you have to use it? If you like it, certainly go for it; if you do not feel the love attraction when you look at the Mandarin ducks, rest assured there are hundreds of images out there that can speak to you of love and devotion. Let's look at the use of Mandarin ducks as a Classical feng shui cure for love, and then see if there are other, more appropriate (for you) images with good feng shui energy of love. WHAT TYPE OF MANDARIN DUCKS DO I USE AS A FENG SHUI LOVE CURE? You can use either an image, such as a photo or a painting, or choose small statues of Mandarin ducks as a feng shui love cure. You can find small Mandarin ducks statues in different materials -- from faceted lead crystals to figurines made from rose quartz, brass or jade. Because rose quartz holds healing love energy, a pair of Mandarin ducks made from rose quartz crystal may bring additional energy to your feng shui love cure. WHERE DO I PLACE MY MANDARIN DUCKS? The traditional placement of the Mandarin ducks is in the Love & Marriage area of your home bagua. If you use the classical feng shui school, then place your ducks in the Southwest area of your home. If the BTB feng shui school is your choice, the focus on the upper right corner, or area of your home. Another good feng shui placement is in your personal lucky direction for love, which is based on your date of birth. HOW DO I DISPLAY THE MANDARIN DUCKS? 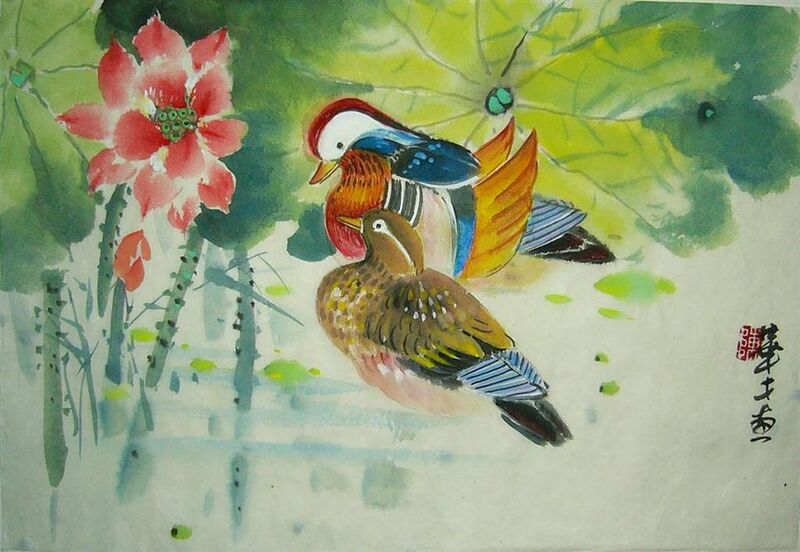 Always display your Mandarin ducks as a couple, never have just one duck as it will not work as a happy love symbol. Have them face the same direction and be sure the energy around them is clean, well lit, attractive and fresh. WHAT IF I DON'T LIKE THE MANDARIN DUCKS? No worries, you can easily find another feng shui cure. Full points to you for your honesty! The truth is I have rarely seen a client ignite with longing for love and devotion at the mentioning of Mandarin ducks. I know I don't associate lifelong devotion with the image of Mandarin ducks. The way to find the best love symbol is to ask yourself which images stir the energy of love and the desired relationship in your heart. You can choose a representation of a happy couple -- be it art or photography -- or keep exploring the animal kingdom for a loyal energy similar to the Mandarin ducks. Swans, eagles, turtle doves, wolves, most penguins, gibbons and many other species are considered to mate for life, so feel free to choose any image that speaks to you. You have to approach feng shui in a wise and intelligent manner. This means you understand that feng shui is powerful energy work, and thus not bound by culturally specific images and quick and magical "fix-it-now-and-forever" type of cures. No feng shui cure will ​solve your problems; but good feng shui energy created in a skillful way will definitely release blockages and invite stronger, more potent energy to support your life journey.